Dr. Renu Tipirneni is an assistant professor of internal medicine in the divisions of general and hospital medicine and at the Institute for Healthcare Policy and Innovation (IHPI) at the University of Michigan. Her research focuses on investigating the impact of health reform policies and programs on aging and other vulnerable populations, and on the delivery of care in the healthcare safety net. 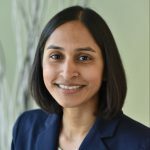 Dr. Tipirneni’s current work includes examinations of access to care under health reform, Medicaid policy (including recent consideration of work requirements for beneficiaries), integration of behavioral and physical health care, and assessments of social determinants of health in clinical practice. She is a co-investigator on IHPI’s evaluation of Michigan’s Medicaid expansion (the Healthy Michigan Plan) and is principal investigator of the Michigan’s Medicaid Health Homes program (MI Care Team) evaluation. She is passionate about the translation of research into implementation of health policies and practice and looks forward to the opportunity to further develop policy translation and communication skills during the CHRT Fellowship. Dr. Tipirneni’s clinical practice includes primary care and hospital medicine for adult patients at Michigan Medicine and the VA Ann Arbor Healthcare System. She completed her undergraduate studies at Cornell University; her medical school training at the University of California, San Francisco; her internal medicine residency at Massachusetts General Hospital; and her health services research training in the Robert Wood Johnson Foundation Clinical Scholars Program at the University of Michigan.